Taste, Euronews' culinary program has visited Japan, a gastronomic treasure house with exceptional food products. We decided to criss-cross the country, from Nagano to Tokyo, with a stop-over in Hokkaido, and on the way we discovered the real wasabi, a plant eaten fresh and grated, some of the fleshiest and tastiest scallops you can find, anywhere, and the benefits of soy milk cream, which is rich in protein. Taste also offers you the chance to learn how to cook with these delicious ingredients thanks to the recipes of a Michelin-starred French chef who accompanied euronews' Sophie Claudet on this culinary tour. We started our trip in Nagano province to find out about Wasabi, a prized plant that grows in spring water. For more than a decade French chef Thierry Voisin has cooked in Tokyo, winning a Michelin star for his fine dining. He understands the value of fresh wasabi in Japanese cooking. "Wasabi is an important ingredient in Japanese cuisine. It brings depth of flavour, gentleness and great strength, elegantly combined," he says. When grown in a greenhouse, wasabi can be picked throughout the year. The tastiest part of the plant is just above the root, and is eaten fresh and grated. He is insistent on sourcing quality products, and farmer Keiichi Mochizuki knows all about his produce. Thierry Voisin, chef Les Saisons restaurant, Imperial Hotel, Tokyo. "Truly fresh wasabi smells really good and tastes wonderful, why is that ?" "The water from the spring we use is at a constant temperature, around 13 or 14 degrees all year long. That's ideal for wasabi, and that's why it's so good." "Chef Voisin, the wasabi we just tasted is much better than the one in tubes." "Definitely. Wasabi tubes are convenient, but there's nothing better than fresh, natural ingredients." With a promise to cook for Sophie on her return to Tokyo, Voisin then returned to his hungry clientele, while Sophie continued her tour from table to field by seeing Mr. Mochizuki's factory, of which he is very proud. Some of his output is vacuum-packed for export to Europe and Asia. A kilo of fresh wasabi is worth 400 euros, because it's so rare. "A plant is ready to harvest after a year and a half to two years, and there are very few growers because there are very few places where it can grow, so supply is very limited," he says. Back in Tokyo, we discover Chef Voisin's wasabi recipe. "So, we're going to cook mackerel in a white wine jelly, and accentuate the mackerel with a wasabi sorbet. For the sorbet we need fresh milk, cream, inverted sugar, (normal will do), and boil them. Grate the wasabi, and then add it to the mixture. Add some wasabi leaves, for the vegetable matter and also the sublime colour, and then pour the mixture into a freezer bowl, and freeze. Serve the dish up, with the sorbet on a wasabi leaf." Chef Voisin then leaves the tasting to Sophie. "Thanks. Should I take a whole bite of mackerel ?" "Yes, take a generous piece of fish with the vegetables, a little jam, and the sorbet that will line the palate." "Next stop, Hokkaido, up north, to taste their scallops!" The port of Abashiri, in the north-eastern part of Hokkaido Island, is renowned for its scallops, which are exported all over the world. On the dockside Sophie & Thierry see tonnes of scallops being landed. Between 10 and 40 tonnes of scallops are taken from the waters of north-east Hokkaido here every day. The region is one of Japan's richest fishing areas, and as Voisin says, the scallops here taste incredible. "Do they taste very different from European scallops?" "The taste is different, but the paradox, which is pretty incredible in all these high-quality products, is that the gentleness, the acidity, the balance and the texture are the same, firm yet melting at the same time." Sophie then turned to a local wholesaler and retail dealer of marine products and fresh fish, Toshiaki Neda. "Mr. Neda, you are a wholesaler here on Hokkaido, and it's said the scallops here are the best in Japan. Why?" "Japanese scallops are very natural, and especially fleshy. They are high in proteins, so very good. I think they're the best in the world!" he says. We decided to explore Mr. Neda's factory to see how he exports his scallops to the rest of the world. First the scallops are shelled and then rinsed in seawater, before part of the production is frozen for export. Mr. Neda's factory is the first on Hokkaido island to get the certification needed to export to the EU. But his scallops go elsewhere in the world, too. "Hokkaido's waters produce 500,000 tonnes of scallops every year. We get a lot of orders from Europe, but also from America and South-East Asia, because they like the top quality we offer," he says. Back in Tokyo, Chef Voisin is going to prepare pan-fried scallops for us, with a sweet potato puree. "There's an orange zest glaze, and an apple and onion jam with a touch of saffron. It'll be a little like a jam, the apples, onions and saffron. Ten minutes to cook, and it's magnificent. Now we'll cook the scallops until they're nicely golden brown. Plating up, we have the sweet potato, the glaze, we drizzle the mixture on our coquilles St. Jacques, and look at that? Doesn't that look delicious, Sophie?" Then the scallops can just sit on there, like that. A few flowers, and leaves scattered by the wind. All you have to do now is taste it." "With pleasure ! Thank you ! It's delicious, chef, Thank you, and thank you for your recipe that you can have a go at making on euronews.com. What are we off to next?" "We're staying in Tokyo to discover tonyu cream or soy milk cream." Sophie chose a dance studio to introduce us to soy milk cream. It's a healthy, protein-loaded alternative to animal-derived products favored by those looking after their diet like the ballerinas who come here to train. After their dance lesson it's time to eat, and eat well. The ballerinas go and have lunch in a restaurant right next to the studio. Dishes are varied, mostly Italian-inspired. The risotto, like the spaghetti carbonara, is prepared with soy milk cream. "So, chef, tell us why you like cooking with soy milk cream?" "Generally speaking and when compared to animal-derived products, soy milk cream has a lot of proteins, few calories and is low in fat. Also, as you can see here, it’s an ingredient that works well with savory and sweet dishes," says the Executive Chef of the Dance Cube cafe, Mitsuhiro Tanishika. Chef Tanishika’s dishes have certainly won over the dancers. "I’m eating spaghetti carbonara prepared with soy milk cream, and it tastes exactly like regular carbonara, only lighter! And it’s very good!" says one woman. The dance instructor, who used to be a professional dancer, savours a tiramisu. "Tofu and soy milk cream contain a lot of proteins, which is really good for physically active people. Soy milk cream can also be used in desserts. Sweets make me happy and that’s why I love soy milk cream!" she says. Soy milk cream, which is also called tonyu cream, is not only an ingredient of choice here in Japan. Western chefs are also starting to cook with it. "For my next recipe I’m going to prepare a poultry tiramisu using tonyu cream instead of mascarpone. You still get the same mascarpone-like texture but it’s tonyu. Put four egg yolks in a large pan, add water, a pinch of salt and beat the mixture until it gets creamy. Once we have a nice emulsion, add gelatine. Then add the soy milk cream. Mix it all delicately, and it's done. Here we are Sophie, that’s our tiramisu. I let it harden a bit in the refrigerator. Let’s place some carved lobster on top and then top it off with lobster aspic. A few flower petals, and the pleasure of tasting is all yours, Sophie." "My pleasure, chef! It’s delicious chef, very fresh on the palate. And now chef in closing, how about a quick recipe, easy to whip up after a long day at work?" Let's slice some fresh ones, and dry ones. Dry shiitake mushrooms bring in depth, they have an intense taste. Let's now cook them, add a bit of vermouth, and heat until well-reduced, that's an important step. Add the poultry stock, a drop of milk, a little cream. Let's blend our cream soup. Plate it up in a deep dish. Add several slices of high-quality Spanish ham on top, with a dash of cream to look like a cappucino, and end with a few splashes of honey vinegar. Sophie, you know what you have to do now..."
"It's very, very good. That's it chef, our culinary tour of Japan ends here. 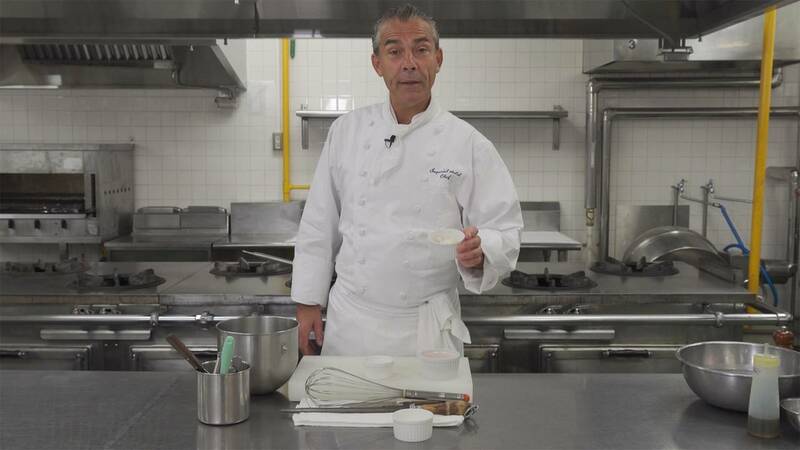 Don't forget : Thierry Voisin's recipes are all on euronews.com."